I’m all about age appropriate education and prevailing classroom circumstances. There are plenty of WHEREAS’s which read like a climate change denier’s blog post. That's VERY easy to argue against, especially when it finds its way into the legislature. This resolution that purports to know a great deal about the value of scientific evidence includes astrology in its list of sciences. The House has approved this 36-30. The Senate continues to defer consideration. Maybe they're busy working on a resolution putting additional emphasis on legislator literacy. In 2006 the South Dakota Congress, as part of a larger DUI effort, attempted to remove bicycles from the definition of vehicles. Looking back four years ago I see much more clearly how close we were to disaster that year. Fortunately the effort failed and the full Congress affirmed that bicycles are vehicles. Four years later, as the Senate discussed SB 70 - the 3 Feet Please Bill - Republican Senator and Transportation Committee Chair Mike Vehle went to bicycle law school and found himself an education. His education was so effective that he ultimately was able to orally report his findings to the full Senate. Indeed, his presentation was so well put together it seems even a room full of sitting Senators was able to understand the lesson. Ironically it is bill sponsor Sandy Jerstad's persistance in smoking out her "educational" bill that provided her opposition the opportunity to provide excellent education on the current laws. Interesting that Senator Vehle's lesson hinges on the definition of bicycle as vehicle that was preserved four years ago. Let's listen in as Senator Mike Vehle lays out the case for why 3ft isn't enough when the law clearly provides use of the full lane. I think Senator Mike Vehle has a bright future as a bicycle advocate! Somebody should go tell Bob Mercer that he might need to catch a bigger fish. The MinusCar Project greatly apprecitates the thoughts expressed by the Madville Times today. From the beginning - "What worries me is that this amendment would criminalize casual bicycle use for 99% of the potential pedaling population." To the end - "And for pete's sake, don't make it any more expensive for folks to get out of their cars and travel under their own power." 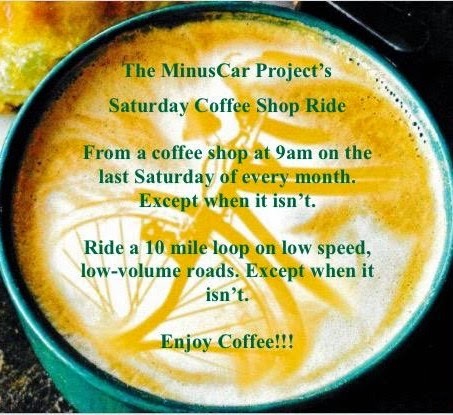 The MinusCar Project lends to bicycle entrepreneurs through Kiva.org. Like Stepan Ivantsiv in the Ukraine who does bicycle sales and wants to increase the variety of his stock. Like Ruben Samuel Villamar Munoz in Ecuador. He wants to use the loan to buy tires and inner tubes for his business. Like Jose Ernesto Gutierrez Garcis in Nicaragua. The financing he is requesting will be used to buy replacement parts and accessories for bicycles to sell and, when a customer buys said parts, to install them on their bicycles. All three for $75. A little goes a long way. Three Feet Please? SB70 had an exciting day yesterday in the legislature. Voted down 4 to 3 and tabled indefinitely, then "smoked out" and passed to the full senate by 3pm. Good times. Like reality TV only real and not on TV. I was able to listen live (.mp3) to the discussion which is always informative. The Local Daily reported on the bill's progress in today's issue. I recognized some of the names mentioned in the article. Today I sat in on a Plain Green 10 Conference planning meeting. That was sort of fun in a "I'm outside my comfort zone" sort of way. On the opening day Steve Clark of Bike/Walk Twin Cities will speak. I kinda sorta had a little to do this this. April's a long way away but his plan is to ride here to present. His plan also is to participate some in the April 30 South Dakota Bicycle Coalition Traffic Skills 101 course...which I believe is mentioned in the article I referenced in the first paragraph. "Nobody is home in the cities of the future. In a decade, they saw real property defy reality in real time in these insta-neighborhoods that sprouted in what had been some of the world’s most productive farmland. In places like Lathrop, Manteca and Tracy, population nearly doubled in 10 years, and home prices tripled. After inhaling all this real estate helium, some developers and their apologists in urban planning circles hailed the boom as the new America at the far exurban fringe. Every citizen a homeowner! Half-acre lots for all! No credit, no problem! Others saw it as the residential embodiment of the Edward Abbey line that 'growth for the sake of growth is the ideology of the cancer cell.'" "In the meantime, during these low, ragged years, a few lessons about urban planning can be picked from the stucco pile. One is that, at least here in California, the outlying cities themselves encouraged the boom, spurred by the state’s broken tax system. Hemmed in by property tax limitations, cities were compelled to increase revenue by the easiest route: expanding urban boundaries. They let developers plow up walnut groves and vineyards and places that were supposed to be strawberry fields forever to pay for services demanded by new school parents and park users. Second, look at the cities with stable and recovering home markets. On this coast, San Francisco, Portland, Seattle and San Diego come to mind. All of these cities have fairly strict development codes, trying to hem in their excess sprawl. Developers, many of them, hate these restrictions. They said the coastal cities would eventually price the middle class out, and start to empty. It hasn’t happened. Just the opposite. The developers’ favorite role models, the laissez faire free-for-alls — Las Vegas, the Phoenix metro area, South Florida, this valley — are the most troubled, the suburban slums."